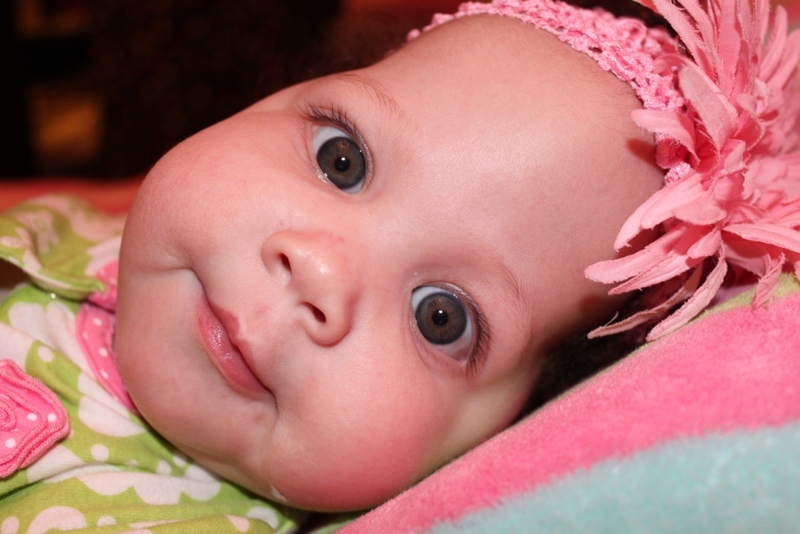 Selah has the most beautiful eyes! She has her birth mother's hair (African American) and the fair complexion of her bio father (white). 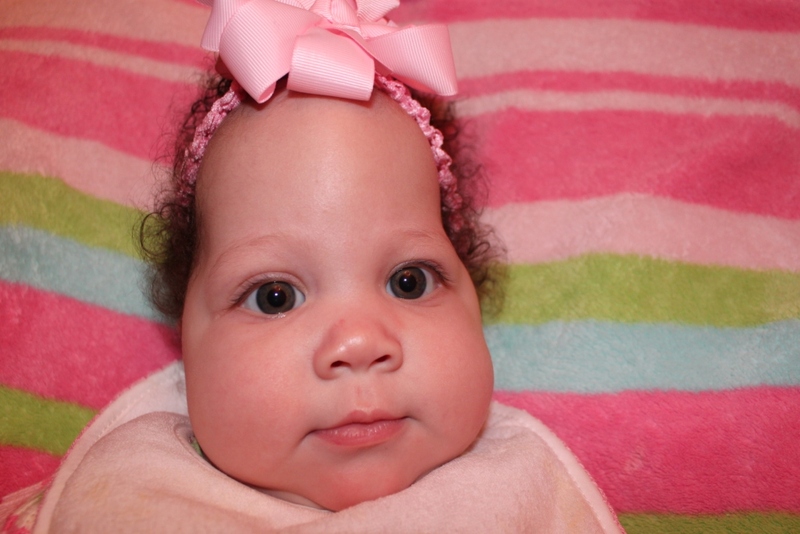 And she has the most pinchable cheeks, just like her sissy in heaven! After I made my wholehearted commitment to Selah and Ella , and God knew I was really serious, He allowed me the privilege of viewing Selah's medical records. He even trusted me enough to let me set up doctor's appointments with Selah's specialists. I felt so grateful to finally get my hands on information that I had been longing to learn more about, and God had given me peace that He would enable us to walk through whatever He has in store for us with another special needs little one. Even Kiefer helps take care of his baby sister. (BTW, Kiefer adores Baby Selah, and her bio sister, Ella!) So precious! Now, I realize this isn't the most flattering photo, but I just had to post it to show how much Selah is thriving! Look at that big ole belly and the rolls on her thighs! I'm sure Selah will not appreciate this photo when she's older, but for now, I just had to share! Over the past two weeks, Selah had various appointments with specialists. She had an MRI of her brain, a visit with the neurosurgeon, a consultation with the neurologist, an evaluation with ECI (Early Childhood Intervention), a 4-month-old well check with our pediatrician, another evaluation with ECI (with a physical therapist), and a consultation with a craniofacial surgery team of specialists, including another neurosurgeon. 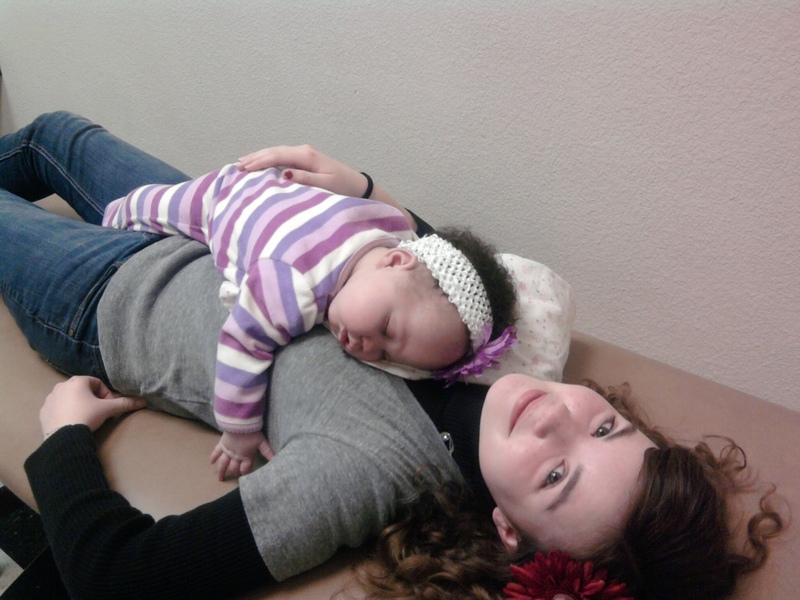 The results from all of these check-ups are unanimously in agreement of how well Selah is doing. Most of these doctors saw Selah at birth and didn't expect her to live. They're just stunned at how much she's thriving today! Selah is developing and progressing at what appears to be a very normal rate. Although there are areas where Selah's developmental is at a 2-month-old level (and she's now 4 months old), she also has areas of her development that are at a 4-month-old level and even a few at a 6-month-old level. Selah will have physical therapy and occupational therapy once a week to help her in the areas where her developmental is delayed, and with much prayer and dedication, we expect to see much progress over the next few months. Selah, at her 4-month-old well check, sacked out on her sister Mattie on the exam table. It's been a delight to bond with Selah and watch her develop. Babies are just such a joy. With hours of cuddle time, feeding time, rocking, bouncing, walking, and loving, it's just impossible not to fall head over heels in love with this little sugar-pie! It makes our hearts sing with joy when we see Selah rapidly developing and absolutely thriving in our care. 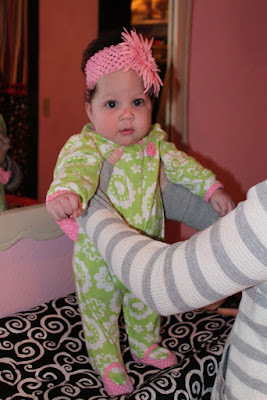 Selah is in the 97th percentile in weight and 99th in height! She's cooing and "talking", imitating our sounds, squealing with delight, kicking her legs with excitement, sitting with support, standing with support, grabbing at toys, putting things into her mouth, and, the biggest joy of all: LAUGHING!!! Oh how blessed we've been to have a baby in our home who brings such delight to our souls. Yes, indeed, children are a gift, a blessing of the Lord! But with all of the fun of a baby, we have to face the reality of a special needs hydrocephalus baby. 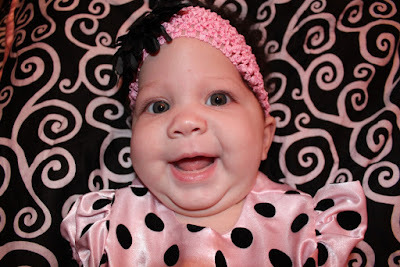 Selah will need to have skull/brain surgery, most likely when she is around 8 months old. Because her skull was stretched so large when she had 3 pounds of fluid on her brain, she has skull issues that many hydrocephalus children do not have. Selah's skull bones crossed over one another after the fluid was drained via shunt, causing severe malformation of her skull. Because these bones have already fused in the wrong position, Selah will require skull surgery. Selah also has fluid between her brain and her skull, with a possibility of having brain bleeds. Because Selah's skull was stretched so large, there is a gap between her brain and skull, where fluid is collecting. 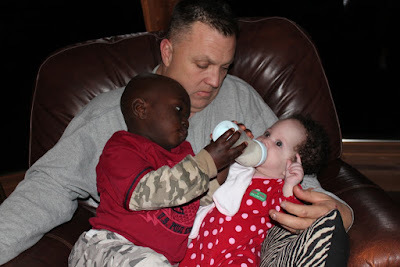 Selah is also "missing" part of her brain that connects the right and left brain, and several areas of her brain are malformed. Selah may require additional brain surgery, depending upon the results of an MRI and CT scan obtained under sedation. Look at Selah stand! It's really hard for her to hold her head steady because of the size, but she's doing great! We feel very blessed to be working with this team of doctors, including the neurosurgeon and craniofacial surgeon, who consulted with us in depth yesterday (Thursday). Through tears, Matt explained that we want to do everything in our power to preserve Selah's life while taking care of her needs, but ultimately it's all up to The Great Physician. And He is mighty to save, even when the outcome doesn't align with what our hearts desire. This we knew. This we have lived. And God has held us and carried us faithfully through the heartache, uncertainty, confusion, anger, frustration, sadness, an disappointment with Chrissie's outcome. Yes, it's been hard, so very hard, but, once again, God has enabled our hearts to love unconditionally, regardless of the risk. 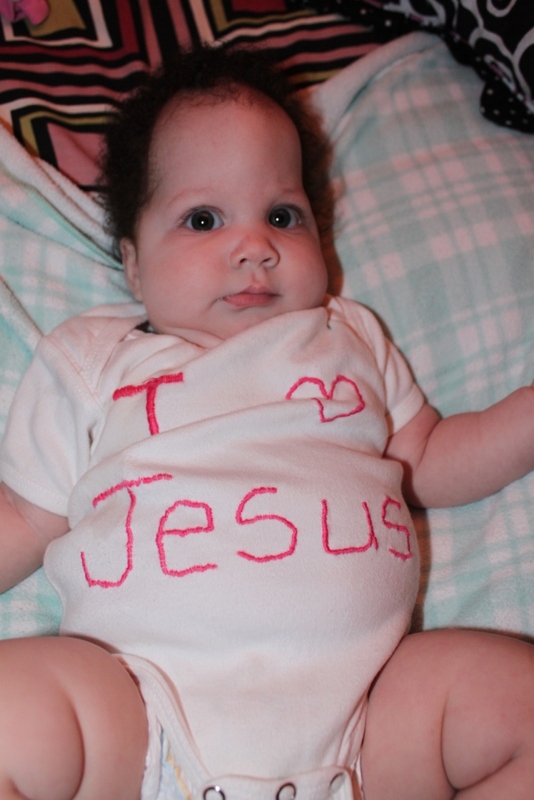 Would you please join us in praying for our Jehovah Rapha to bring complete healing to our Baby Selah? She will have her in depth MRI and CT scan, under sedation, on March 7. This will require out-patient hospitalization, as the sedation will require intubation (breathing through a tube with a ventilator). God has asked us to walk this path, and we have experienced first-hand the miraculous power of prayer and the peace that surpasses all understanding when given by our Redeemer. We are most grateful for your prayers, encouragement, and support.